Sparkhead Kids company is our Toronto neighbour. They make wonderful duvets, curtains, cushions and prints to decorate children rooms and brings some magic to their dreams. We adore their unique designs you cannot find anywhere else. Sparkhead Kids also writes and illustrates own books with engaging stories and activities every kid would love to read and be involved. Their products have the whole set of characters to follow and enjoy with your children. I like how they match everything from bedding sets to books and art prints. The room can look according to the favorite theme and have a unique style. 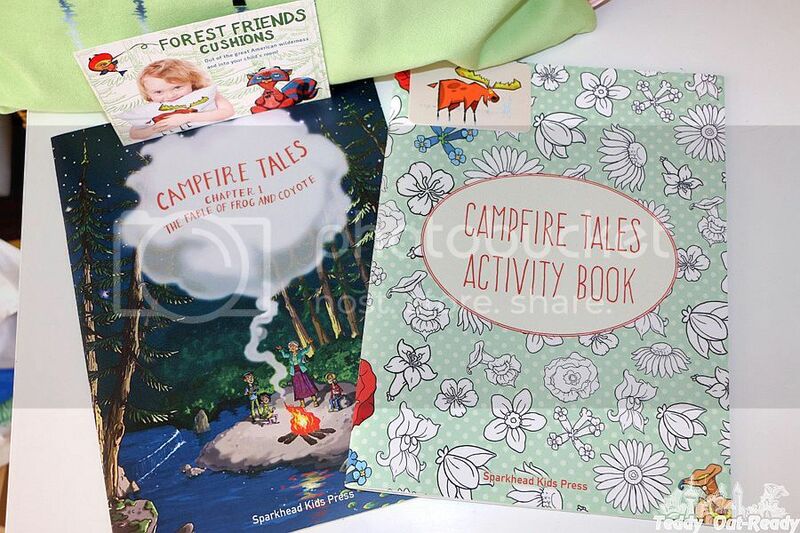 Recently, we had a chance to review their Campfire Tales books which includes Activity Book and the story about Frog and Coyote. 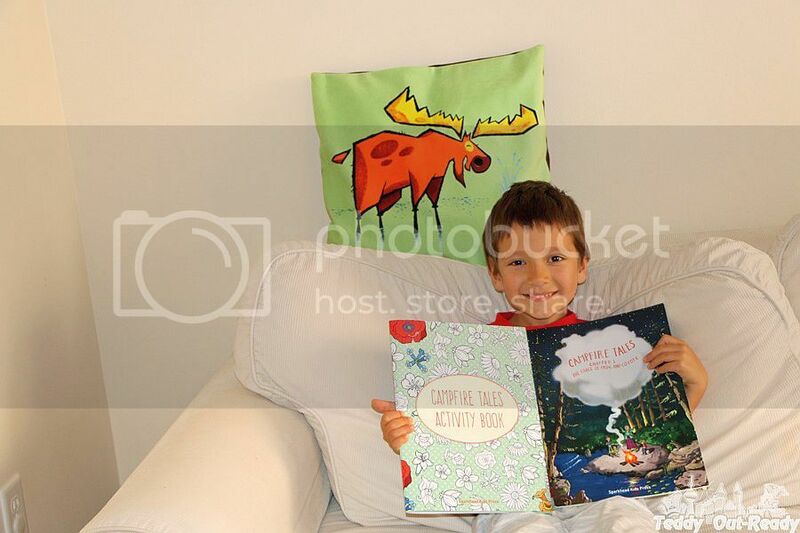 We also received an absolutely fantastic Golden Moose Green Velveteen Cushion Cover. Since we spend our summers camping, campfire stories and activities was very interesting for Teddy to read. He read the story about Frog and Coyote at bed time one day. He liked it so much except he said that Grandmother does not look like one. We told him that Grandmother has to be young and active to go camping, so after that Teddy totally agreed with the book. The Activity Book is fun for kids too. It is pretty thick and has interesting tasks for children, from coloring and matching to learning about First Aid and forest animals. 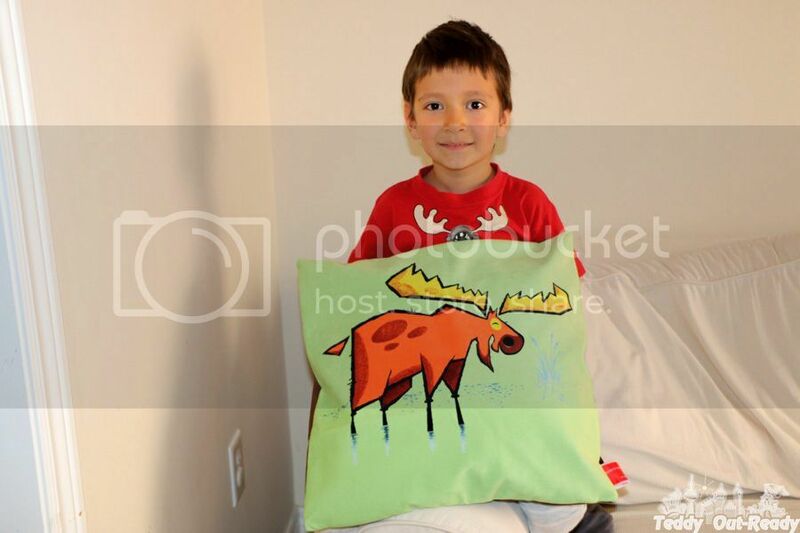 Moose pillow cover is colorful quality product with very cute animal design. We love the bright colors used for this product and soft velveteen, perfect for kids and their rooms. Children start asking questions and become more interested in learning about the Great North American Wilderness, forest habitats and how they look like. Teddy said that the pillow is so soft and he likes the design on it. Sparkhead Kids offers a wide selection of products for boys and girls just check the company on-line store. The products also make wonderful gifts from new born babies to grownups as their creative room décor prints and bedding can brighten any children room and enhance their imagination! With upcoming Father’s Day and Canada Day you can find unique, one of a kind and special gift at Sparkhead Kids, made in Canada with love of nature and art. 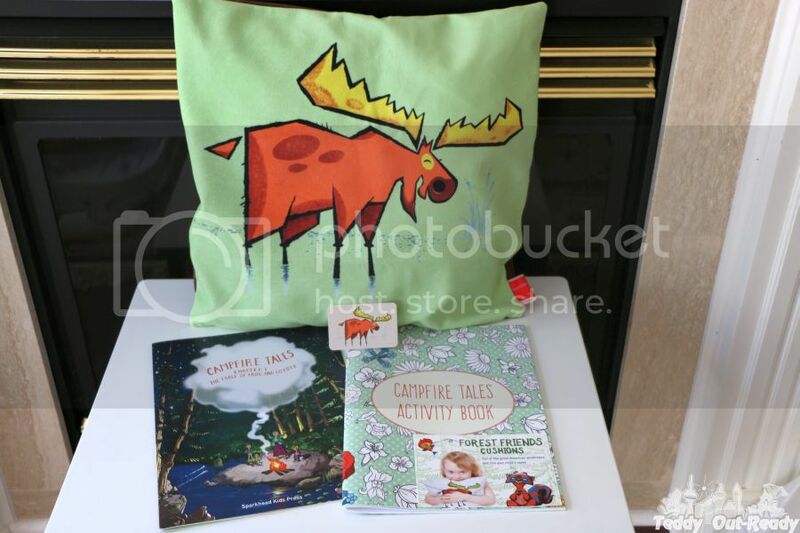 For our Canadian readers we are excited to giveaway Sparkhead Kids prize pack which includes Golden Moose Green Velveteen Cushion Cover ($45), Campfire Activity Book and Picture Book The Fable of Frog and Coyote ($45). For your chance simply fill the Rafflecopter form below, the giveaway ends June 25, 2016. I also like George’s Voyage Growth Chart, it's so cute! I also like the Fiona’s Garden Pink Duvet Cover, Curtain + 2 Cushion Set, so cute!! Love love love the Dazzling Nighttime Forest in Moonlight Duvet Cover! These products are all so unique, I love the Forest in Moonlight Duvet Cover, Curtain + Cushion Set. What a great line of products - the designs are just adorable. I also love the Happy Bunny Green Velveteen Cushion Cover. The fluttering hummingbird print and books! I like the Fluttering Hummingbird Blue Velveteen Cushion Cover. Thank you for the giveaway! I like the curtains, the peaceful forest lime. I love the Fiona and her Magic Garden White Duvet cover - beautiful! I think the Fluttering Hummingbird blue Duvet Cover is so cute. It would be great to win a Sparkhead Kids prize pack. visit Sparkhead Kids and comment with another product i like. I like the Fluttering Hummingbird blue Velveteen Cushion Cover. What a great site !! My outdoorsy niece would LOVE the Dazzling Nighttime Forest in Moonlight Duvet Cover . I will have to get it for her for Christmas . Needless to say she would be over the moon for this prize pack. I love the Lucky Frog Print. It is adorable!